Posted by ronannarbor in Entertainment, Movies. 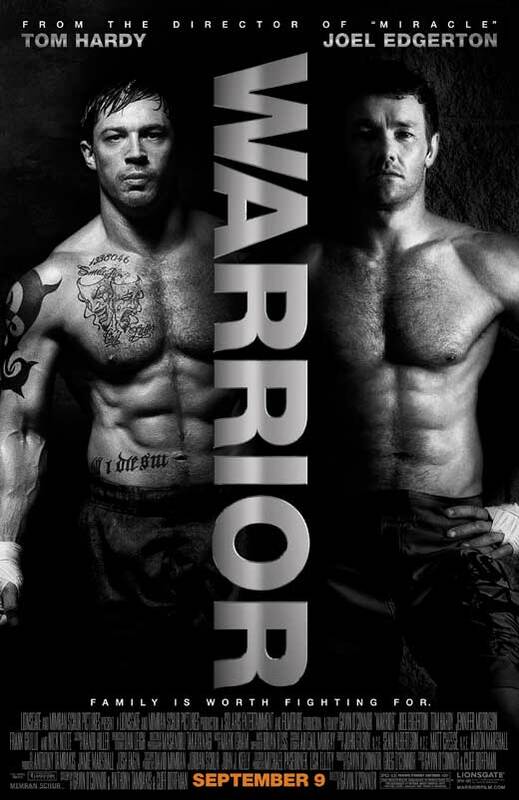 I’m happy to report that WARRIOR, seen at an advanced screening yesterday, won’t need much more than those posters. It’s a terrific fight movie, and possibly the years first Best Picture candidate. Tom Hardy (Inception) and Joel Edgerton (countless Australian movies and tv shows) playing brothers, are superb in Gavin O’Connor’s (Miracle) MMA-themed family tragedy movie. Nick Nolte positively shines in his role as their father. And there isn’t a single wrong note in the casting. O’Connor proves that Miracle wasn’t a fluke — he has a genuine knack for the inherent drama in sports and competition. But this isn’t your standard fight movie. Mixed Martial Arts (MMA, or for us old-timers “cage fighting”) holds center stage here, but like the best fight movies, serves only as the background for the grander themes being played out: in this case, family-related loyalty, pain, and destruction. Without giving away too much in this surprise packed drama that heaps one revelation upon another, I’ll give away only as much to say that Nolte plays an ex-alcoholic who has driven a wedge so deeply into its family system that brothers haven’t spoken for almost two decades, and there isn’t much love going around. Hardy’s character has cared for his mother and served in Iraq; Edgerton’s character has stayed behind and raised a family, now up to his ears in debt due to a sick child, and works as a schoolteacher. The master-strokes of drama delve into Hardy’s attempts to escape the grief that follows him from one life situation to the next; while Edgerton’s follows an anything-for-my-wife-and-kids path. Sure, the themes have been seen elsewhere. Sure, much of the symbolism has been seen elsewhere. But that doesn’t mean that O’Connor hasn’t discovered something all-together new and different in this tale. I won’t say anymore, but to add that the ending is about as perfect as you can get. Alternating between standard film, hand-held cameras, and media coverage, it all feels gritty and real…the movie is fiction, but it plays like a true story, and by the time you reach the final fight sequence, your emotions will be as conflicted as those depicted on the screen. About halfway through the movie, O’Connor achieves something in film that rarely works well – and here it works spectacularly: escalating the action of almost two months into a several minute split-screen montage of slices-of-life of what is occuring in two parallel families, the film lifts from the ordinary to the sublime. And it stays there for the remainder of the film. Choose your sides — root for your favorite brother — and have a swell time at the movies. This is an emotion-packed big old fashioned wallop of a motion picture, and I highly recommend it. Unreal film, pretty much hits the high spot in every aspect, and the ending, emotional just about covers it. Great song to end on also….